SPEAKING to The Star executive editor ERROL OH on the sidelines of the Ernst & Young World Entrepreneur Of The Year award ceremony in Monte Carlo, Monaco, Tan Sri Liew Kee Sin, president and chief executive officer of SP Setia, said that it will take 10 to 15 years to develop the project and that he expects the gross development value to reach around £8bil (RM40bil). Here are excerpts from that interview. STARBIZ: Could you please comment on the deal? Liew: We have signed an exclusive agreement for 28 days to go into detailed negotiation on Battersea. The price is confirmed £400mil (RM1.97bil). Most of the heads of agreement have been agreed upon. We are committed to maintaining the existing approvals given by City of London, principally the local council where the project is. We are also committed to maintaining the iconic structure of the Battersea Power Station. That is crucial because as in many developed countries, the local sentiments are very, very important. The structure has been there for a long time. I think it's good that it becomes a symbol of the project. So, as far as branding of the location is concerned, it's already there. You don't have to tell the whole world where the project is. Just need to say Battersea Power Station and the whole world knows where the project is. We also support the council's proposal to extend the Northern Line (of the London Underground Tube). The Northern Line is key. If the project was smaller, we wouldn't need the extension. But a project of the scale of Battersea needs the extension. We're talking about almost eight million square feet of gross space in that area. There would be about 3.5 million sq ft of apartments and 500,000 sq ft of social housing. The balance is retail, offices, car park space and so on. We are committed to contributing a proportionate sum for the Northern Line extension. The indicative figure we have been informed is about £200mil. This is a major redevelopment project for London. The local council wants the Battersea Power Station project to regenerate the whole area. The key for us is to relook the planning approvals already secured for the project by the previous owner, tweak it based on the experience we have while maintaining the good elements. The idea is to use Battersea Power Station as a symbol of regeneration. We have to be very innovative so as to take advantage of an existing icon. We don't have to reinvent the wheel but we want the project to be unique and incorporate a bit of Asian influence. We expect a major portion of our customers to come from Asia. We want to promote both the East and West. As for SP Setia, the project is part of our ambition to be a real multinational corporation. We're happy to work with a like-minded company like Sime Darby, which had gone overseas well ahead of us. With the combination of us and Sime Darby, we have a good chance of succeeding with this project. Why choose to partner Sime Darby? This project will have almost £8bil in gross development value. Not many Malaysian companies can take a project of such scope, complexity and size, including SP Setia, on its own. Sime Darby has the international exposure and global branding and has done massive townships in Malaysia. We think it is a good partner, with the combination of the two companies' resources. It has changed tremendously in the last two years, after Datuk Mohd Bakke Salleh became the chief executive officer. For now, it's a 50:50 joint venture. A joint-venture company will be formed. With the support of the SP Setia customer base and Sime Darby's customer base, hopefully we will be able to succeed with the project. What will be the items that will be important factors during the 28-day period? We have been looking at this deal for many months. We have actually done most of the technical due diligence. Over the next 28 days, the key factor is that the joint administrators and receivers (two partners of Ernst & Young LLP) need the time to resolve any possible issues with the previous owner. For us, if they agree tomorrow, we can sign the agreement straight away. On our part, we're almost there. We support the council's proposal for the Northern Line extension. We accept the planning approvals that have been given. We've also done a detailed study on how to maintain the iconic structure. It's now more about finetuning the masterplanning and what we can do in giving our input. We'll tweak it a bit to make it really different. People always question our ability to undertake the project because we've never done something like this. But with our track record in Malaysia how careful we have planned and executed our projects and have done about implementing the eco theme in the projects this gives us enough confidence in ourselves. Our success with the projects in Singapore and Melbourne also gives us a lot of confidence that the Malaysians who want to invest in property in London will come along with us, and hopefully the Chinese, Singaporeans and other South-East Asians. Malaysians are quite affluent and buy property all over the world, what more from people they already know. Given the scale of the project, aren't you also looking to draw in the local buyers (in the United Kingdom)? Yes, we're aiming to have 50% local buyers. But as you know, there's a downturn in the United Kingdom, so the locals may not invest heavily in the UK property market right now. There's the risk that the local demand over the next two years will be marginal. So we need to drive the demand for the project in Asia first. Hopefully, that will give us enough momentum and volume to take care of the land and infrastructure costs. Because of the downturn in Europe, most of the banks are reluctant to lend to developers. So we will get our funding from Malaysia for now. The key issue is the funding. We are fortunate that the names of SP Setia and Sime Darby are able to secure funding. Just to clarify, the property is more than just the power station, right? The power station takes up 15 acres of the total 40 acres of the site. So we will build around the power station. It will be the magnet that attracts people. The initial idea is to convert the station into space for conventions, offices and food and beverage. It will take 10 to 15 years to develop the project, depending on the strength of the market. The reason we are willing to pay for the land is because the approvals are already there. We don't have to spend another five years getting the approvals. My job is to understand the market. I'm confident that London has the talent the planners and architects. So the main task for us is to figure out where to go to find our market, how do we get market share. PETALING JAYA: Malaysian property giants SP Setia Bhd and Sime Darby Property Bhd are now the preferred bidders for the highly-coveted Battersea Power Station in London. They have outbid rivals from parties such as Russian tycoon Roman Abramovich, whose Chelsea football club is located on the other side of the river. 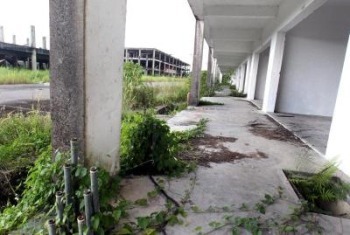 SP Setia and Sime Darby Property's joint bid is RM1.96bil (£400mil) to redevelop the 15.7ha prized property. Both companies have entered into an exclusivity agreement with the vendors of the property, under which they will have 28 days to conduct contract negotiations and due diligence. During this period, the vendors will not entertain any other bid. Speaking to The Star on the sidelines of the Ernst & Young World Entrepreneur Of The Year award in Monte Carlo, Monaco, SP Setia president and chief executive officer Tan Sri Liew Kee Sin said the project would have a gross development value of £8bil (RM40bil) with both firms in a 50:50 joint venture. Despite the hefty price, both SP Setia and Sime Darby Property are said to be comfortable with the project's potential returns and gross development value due to its prime location along the Thames river. “The project is part of our ambition to be a real multinational corporation. With the combination of us and Sime Darby, we have a good chance of succeeding,” Liew said. It is understood that the Malaysian bid was chosen not only for its attractive pricing but also its development plans as well as ability to fund it. The Star had earlier reported that the Employees Provident Fund (EPF) might likely emerge as a partner to the SP Setia-Sime Darby Property joint venture and those familiar with the situation said its participation could come at a later stage. Liew said “the idea was to use the power station as a symbol of regeneration” for London. 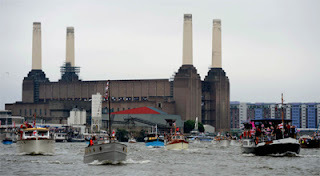 The power station is a famed part of London's skyline and was used as cover shots on Pink Floyd's 1977 album Animals and The Beatles' 1965 movie Help! Its cultural influence has led the British government to list it as a Grade II status building, meaning “particularly important building of more than special interest”. SP Setia and Sime Darby Property have pledged to preserve the iconic facade of the Battersea power plant, which was built in the 1930s and closed in 1983. In a joint statement yesterday, the two firms said they had committed to the construction of a new underground station as part of the proposed extension of the Northern Line (part of the London Under-ground's Tube network), which shall pass by the site. PETALING JAYA: Analysts are positive on the joint bid of SP Setia Bhd and Sime Darby Property Bhd being identified as the preferred bidder for the Battersea Power Station in the United Kingdom, as they say it is a rare opportunity for Malaysian companies to show off their expertise overseas. Sime Darby Bhd was up 3 sen to RM9.71 on volume of 6.86 million shares yesterday while SP Setia was down 4 sen to RM3.75 on volume of 244,100 shares. “That piece of land is in a very prime location in London. “There were many big and reputable names which put in bids for the land. 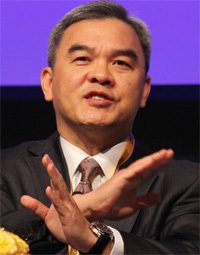 We must commend the deal-making capabilities of these Malaysian companies,” said a property analyst. The Battersea Station is about 3.5km from the Houses of Parliament and has been vacant for almost three decades. The 38-acre site sits on the south bank of River Thames. It was put on sale in February after its owners failed to pay lenders more than £500mil (RM2.47bil). SP Setia and Sime Darby Property have entered into an exclusivity agreement with joint administrators and receivers Alan Bloom and Alan Hudson of Ernst & Young LLP, who acted on behalf of the owners of the property, to acquire the site for £400mil (about RM2bil). Sime Darby and SP Setia will each hold 50% equity in the joint-bid consortium. “The capital expenditure for the land will be about RM1bil per company if the equity stake is 50:50 between Sime Darby and SP Setia. “Their gearing levels at some 10% each should afford both companies enough leverage for more bank borrowings,” said the analyst. With the gross development value of some RM40bil, as disclosed to StarBiz by Tan Sri Liew Kee Sin of SP Setia, it was more than attractive enough for both companies to fork out RM2bil for the land. As the land area is some 38 acres, the analyst said the project would easily be a revenue contributor for more than five years. “It is difficult to predict (profit) margins at this point as London is an unfamiliar territory. Construction costs may also be higher,” said one anlayst. He added that with SP Setia having done very well in Malaysia, it was about time that it expanded its brand overseas. KUALA LUMPUR: Utusan Melayu (M) Bhd may venture into property development in the future as part of its strategy to unlock the value of its current land-bank. Executive chairman Tan Sri Hashim Makaruddin said that this would enable the company to earn recurring income in the long term. The company, which owns 4ha in Jalan Chan Sow Lin, Kuala Lumpur, has leased the land to the service and manufacturing industries. “We can turn it into commercial buildings like office buildings, condominiums and serviced apartments in the future,” he told reporters after the company's AGM. Hashim said that newspaper circulation and advertising would remain significant contributors to the group's revenue on a 60:40 ratio. “Our Utusan Malaysia and Kosmo circulations are on the rise this year, with Utusan Malaysia's circulation up at 171,000, from 151,000 last year, while Kosmo's has increased to 220,000 from 208,000 previously,” he said. Commenting on the company's poor performance in the first quarter of the year, Hashim said it was due to reduced advertisement revenue. “We are hoping, in the second half of the year, things will be brighter given the impending Euro Cup and general election as it will mean more advertisement revenue,” he said. The company registered a pre-tax loss of RM8.679mil for the first quarter ended March 31, compared with a pre-tax profit of RM1.369mil a year earlier. A group of shoplot buyers who have been left in the lurch after the project in Bukit Beruntung was abandoned 15 years ago staged a protest at the Selangor Mentri Besar’s office in Shah Alam yesterday. The buyers of Super Taipan shoplot and apartment project by developer Perwira Indera Sakti Sdn Bhd, a subsidiary of Talam Corporation, are seeking urgent intervention of Mentri Besar Tan Sri Khalid Ibrahim to revive the project. The developer filed for bankruptcy in 2007. K.A. Tan, a representative of the buyers, said 480 out of the original 1,200 affected by the abandoned project were still in limbo while the rest were offered a “swap deal”. Under the swap deal, Tan said buyers were given properties of equal value by the developer in different locations. “We, too, want the Selangor government to swap our lots in locations like Puchong or Bukit Jalil if they cannot develop the Super Taipan project,” Tan told reporters before discussing the matter with Khalid at a closed-door meeting at the state secretariat building yesterday..
Tan said the lots were bought at about RM400,000 each and the buyers have been paying between RM1,500 and RM3,000 monthly to the banks since 1997. “It is unfair to us. We feel cheated paying for properties that were not delivered to us. “Some of us have been threatened with legal notices from banks if we do not pay the instalments,” he added. Tan, who is also a representative of the Bukit Beruntung and Bukit Sentosa Real Estate Buyers Association, said they had sought the assistance of the Housing and Local Government Ministry and the previous state government several times to resolve the issue, but no action had been taken. Another shoplot owner, K.C. Sia, said only six out of 12 blocks of the Super Taipan project were completed. “What is the point of completing these blocks when there is no water and electricity supply. We want the state government to intervene and get another developer to revive this project,” said Sia. In 2009, the Selangor government bought over Talam Corporation for RM391mil. In November last year, Khalid said there were no losses recorded from the takeover of Talam. Meanwhile, a check by StarMetro at the Super Taipan project site in Bukit Beruntung found that the shoplots were in a deplorable condition. The window panels, manhole covers, drain covers, doors and window panes were either missing or damaged. There were also no security guards at the guardpost and rubbish was strewn everywhere. Out of the 12 blocks, only six blocks of shoplots were 95% ready while the other six were half completed. The entire area was filled with undergrowth.